With the aptly titled Words and Music, Saint Etienne offers a statement of purpose for its existence more than 20 years after its founding in what’s essentially a love letter to musical fandom. You could say that Saint Etienne has been too perfect for its own good, at least when it comes to attracting a mainstream audience by creating what the general listening public expects from pop music. But more discerning listeners can appreciate Saint Etienne for being pretty much peerless in its ability to craft immaculate pop songs in all shapes and sizes, from orchestral mini-epics to Abba-esque Europop to electro compositions that seem like hits from the future. Over the years, mastermind producer-types Bob Stanley and Pete Wiggs have gone from searching for just the right sounds to shaping full-fledged songs, with singer Sarah Cracknell more than another pretty voice in the mix, but a driving force behind Saint Etienne’s sophisticated pop vision. If anything, Saint Etienne does what it does with such seeming ease that it’s not hard to take its effortless, breezy sound for granted and overlook how much effort and invention it actually takes to hide all the seams. With the aptly titled Words and Music, Saint Etienne offers a statement of purpose for its existence more than 20 years after its founding in what’s essentially a love letter to musical fandom. Whether it’s reminiscing about buying your first album or capturing the feeling of losing yourself on the dance floor, Saint Etienne pays tribute here to all the visceral experiences that music can open up, from the most private moments of listening to records in your room to public displays of affection in the club. Those are the impressions you get right from the start from the tender opening track “Over the Border”, which works like a prelude to the album as Cracknell narrates a first-person coming-of-age tale that’s defined by musical milestones, beginning with her learning to explore the world through “Top of the Pops” and ending with her wondering how much Marc Bolan would still mean to her when she’s married with children. In between, though, it’s suggested that the memories of her musical relationships are at least as important to her as her crushes and ex-boyfriends, as she litters the song with references to reading NME, listening to Modern English and New Order, and collecting records from Factory and Postcard. Both touching and crafty, “Over the Border” doesn’t just relate Cracknell’s poignant recollections, but it also personalizes some of the influences that have gone into Saint Etienne’s eclectic mix. 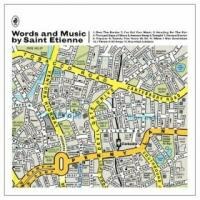 Indeed, Saint Etienne wears its love of all things musical on its sleeve -- literally -- with the cover art for Words and Music, which is an imaginary map with the group’s favorite songs as the street names; as Stanley told Pitchfork, “There are 312 titles on the map -- it’s our hometown.” With tracks titled “Record Doctor”, “DJ”, and “Haunted Jukebox”, you get the idea that Saint Etienne is creating its own musical world on Words and Music, taking those 312 titles, plus more, as touchstones and channeling ‘em through that unique combination of throwback melodies and state-of-the-art techniques that has, well, put the band on the map. Namechecking KLF's “3 AM Eternal”, “Popular” would be just that in an ideal world as it combines radio-friendly electronics and Cracknell’s sweet pop-soul vocals, while “DJ”, as the lyrics suggest, starts out on the High Street but ends up in the underground club, mixing posh sounding effects and an adrenaline rush of techno synths to play out the song’s conceit. Topping off pristine dance-pop keyboards and driving electro beats with Cracknell’s smooth, cool coos, “I’ve Got Your Music” blends its various elements so organically that you can’t imagine they don’t go together naturally. So when Cracknell delivers the line, “Give me one more song...You can do no wrong”, on “I’ve Got Your Music”, she might as well be describing how the singles-quality numbers come one after the other on Words and Music, offering up a little something for pop lovers of every stripe. Ranging from the downbeat R&B of “Last Days of Disco” to the fluffy, fluttery confection of “Answer Song”, Saint Etienne proves not only that it hasn’t lost its deft command over various tempos and textures in the seven years since its last album Tales from Turnpike House, but that the trio continues to push its pop art forward. However, it’s the impeccable single “Tonight” that best encapsulates what Words and Music is all about in theme as well as aesthetic: A song about the anticipation of going to see your favorite band, “Tonight” makes you feel how you feel when the wait is worth it, as atmospheric strings, butterflies-in-your-stomach synths, and stuttering beats fuel the build up, then find release. When Cracknell croons the chorus, “Tonight / The sound is breaking like a wave / Wish I could always feel the same / And life will never be the same”, she might as well be singing about Saint Etienne itself, considering that the group’s own infectious melodies are the stuff of adulation and adoration. What makes Words and Music stand out is that it’s both polished and personal, a prime example of how a big pop sound can reach out and connect in the most intimate ways. Perhaps Saint Etienne’s most fully realized effort and most engaging listen from beginning to end, Words and Music finds the sweet spot between proficient skill and intuitive feel that can be so elusive in pop music. So even as Cracknell recalls wistfully on “When I Was 17” that her “heart and head were full of brilliant dreams” in her youthful days, it’s an older, wiser Saint Etienne that has figured out how to make imagination and ambition into something real with Words and Music. And isn’t that what the magic of a pop song is, for those who make music and those who listen to it?